When you’re tired at Disneyland and the kids have dragged you all over the park, don’t take them to Innoventions. They will run in as many directions as there are kids. It’s noisy and there are lots of things to touch, but don’t fool yourself. There is no real learning going on there. It’s strictly entertainment. 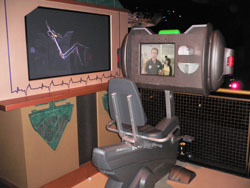 The first part of Innoventions leads you to an irritating singing robot. There is too much talking and singing and not enough showcasing the new things that are coming in the world. They did have these cool bikes with games attached to them and allowed two bystanders to race against each other. It was a good demonstration of how much fun and work exergaming can be. The two volunteers were panting at the end of their races, making it a vivid exhibition of the benefits. 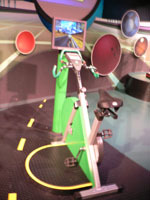 They have a section of Innoventions called Healthy U, where you can scan your pass in at each station. There is supposed to be interesting health information for you at each post. The presentation is so simplistic that there is very little to learn there. It’s also so boring that the kids don’t want anything to do with it. This station, for example looked promising. You ride the bike, an irritating man with an Austrian accent yaps at a skinny guy about how to beef up. You had to scan your pass to make it go, so I thought it would read my heart rate or analyze my speed and give me some feedback. No such luck. The only feed back was the bad Arnold Schwarzenegger impression. 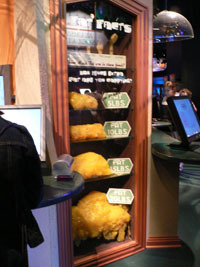 Another station gave the common basic nutrients in food with a very bulky computer interface. 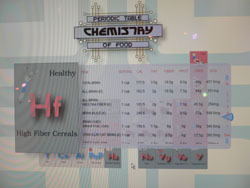 Instead of being able to type â€œhamburgerâ€ into the computer, you had to search through their “Department of Chemistry” table, which organized things to look like the periodic table of elements: not efficient, not educational and not very interesting. Once again, you had to scan your pass to make it work, but there was no personal feedback based on what I scanned. 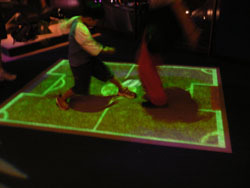 This soccer game was projected on the floor. I watched this boy play the game with his mother. They competed with each other to make goals with the projected ball. The shadows from the players really interfered with game play, so it doesn’t look like a viable exergaming option for the future. The boy was able to consistently get the ball past his mom and into the goal, however, so he didn’t seem to have any problems with it. I never got a chance to play, so I can’t tell you for sure what it was like. Considering you would have to have a television projection unit in your ceiling to bring this experience home, I doubt this one is coming to PlayStation anytime soon. 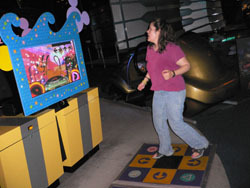 Ironically, the best part of Innoventions is that it’s the only place to play DDR for free in the park. They have DDR games at the Starcade (didn’t check the cost). If you were willing to pay the cost of listening to the robot, Tom Morrow, sing about the “future,” you could play DDR for free. They had DDR Disney Mix and a strange Jungle Book version of DDR (VERY simplistic). The dance mat has been mounted firmly to the floor. It looks like it could last a thousand dances a day. Where can I buy one of those? All in all, Innoventions seemed to entertain the kids that were running from station to station. I don’t know if they found much to do or even learned anything. I learned an important lesson, though. I learned that we didn’t come to Disneyland to play video games, Laura. your own home DDR that didn’t cost a thousand dollars.